Become a member and donate as little as $10 a month to help save our Ocean, and receive a complementary gift. 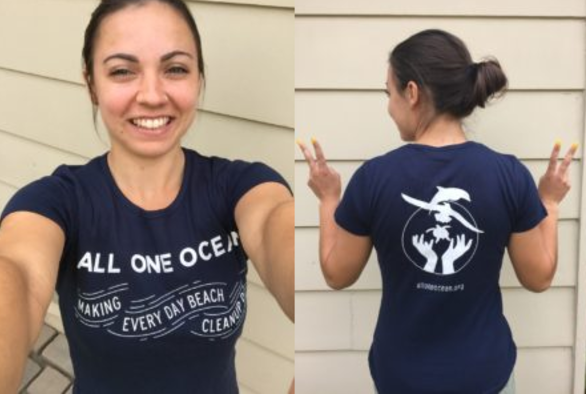 For as little as $10 a month, and you will receive an organic cotton All One Ocean T-shirt, a symbol of your dedication to our Ocean and all of its creatures. Donate as little as $25 a month, and you will receive an All One Ocean tote bag, a symbol of your dedication to conservation and our Ocean and all of its creatures. Own your own Beach Clean Up Station. For $60 a month, we will dedicate a Beach Clean Up Station to you, your family or loved one for a year. We will mount a handmade, sustainable wooden plaque inscribed with the name(s) of your choice on the front of your Station’s post. We will also organize a cleanup at your favorite Beach Clean Up Station or beach in you or your company’s name.